SHERATON PRINCEVILLE - ROOMS. 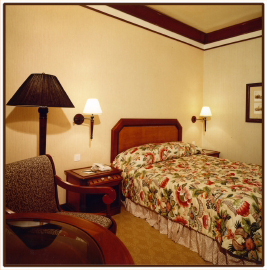 The room decor at the Princeville Hotel is classic historic Hawaiian. The focal point of the room is the "Hawaiian quilt" bed spread with coordinated skirt and drapery. The art features a reproduction of a wood block print by the English artist Charles Bartlett, created in 1918. The custom made furniture is based on elements in the Wilcox Missionary Home Museum on Kauai. Built in the late 1840's, this home and its decor typifies the furnishings of the missionary era in Hawaii. One such piece is the so called "pie safe" cabinet which originally was used to protect the fresh baked pies from flies ( and children ) while cooking. The doors feature perforated metal panels in a pineapple design, the symbol of hospitality throughout Europe and early America in this period. It is now cleverly used to disguise the television set. ORCHARD HOTEL, SINGAPORE. 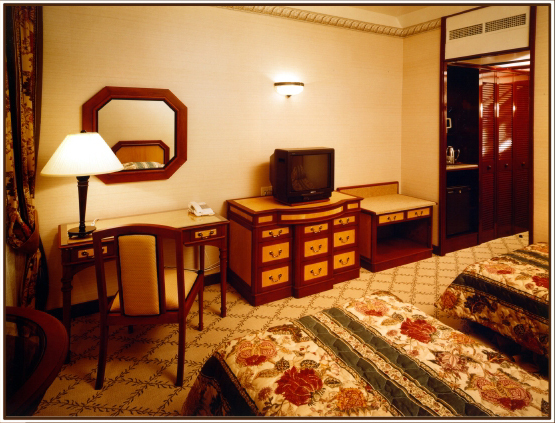 Done in the style of British Colonial, the furniture designed for these rooms was fabricated in Indonesia. The printed carpet simulates woven sisal, while the bed-spread and drapery typify the botanical art studies of the travels of such British explorers as Captain Cooke. The furniture captures the style of the Biedermier era, provential yet formal. The pieces are veneered in light maple contrasted with dark mahogany. The black accent elements in the lamp and trim provide drama, and are typical of the period.